Here’s the second installment on Growing Garlic. If you missed the first one, or want to read over it again, here it is. In the first post, I gave an overview about the process involved with growing Garlic. 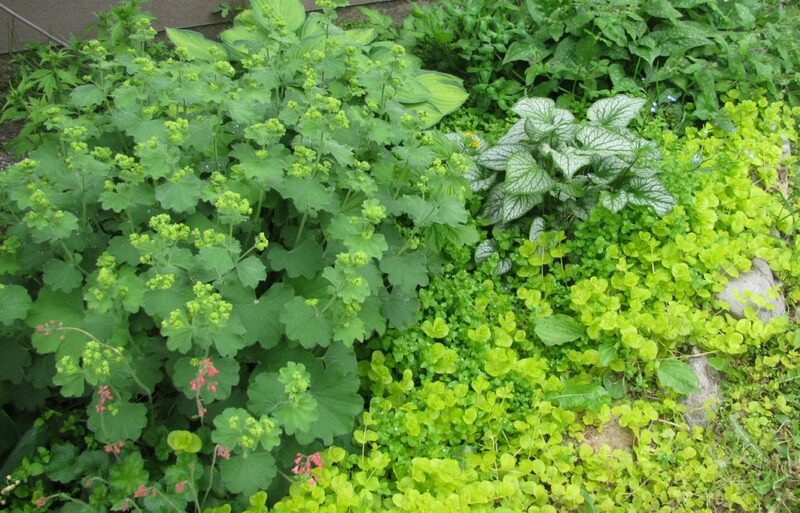 It’s one of the easiest garden vegetables to grow. 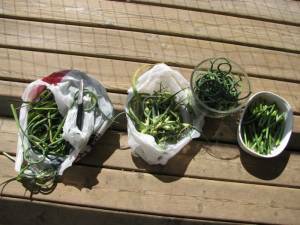 Here in the Cariboo, the Garlic Scapes come on hot and heavy in early August. Since we have almost 300 garlic plants in the garden, we basically have almost 300 scapes! Every garlic plant sends one scape up and if you want the largest garlic heads possible, you have to cut the scapes off. The energy saved by not having the scape now goes into the bulb. That makes it BIGGER, which is what we want – the biggest, best bulbs we can grow. To cook the Scapes, just steam them for a few minutes if you like them still a bit crunchy or longer if you want to soften them. You can also lightly fry them with a bit of sesame oil. Either way, they are delicious. We can only eat so many Scapes fresh with dinner so I looked around for something else to do with them. 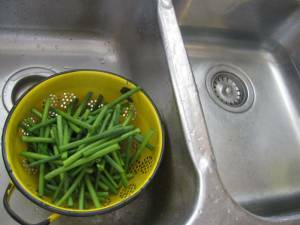 Reading here, I found a recipe for pickling the scapes. Basically, Herrick used the same recipe as you would use to make Pickled Green Beans. We didn’t add garlic but we did have fresh Dill waiting in the Garden, along with a few very Hot Red and Yellow Peppers. But first things first – I went down to the Garden and cut off all the Scapes I could find before retiring to the Porch to get started. I sat down with the bag of Scapes and first trimmed off just above the white bulb, tossing that into another bag. Then I cut off the straight section of the Scape, leaving just the curled part. These went into separate bowls. I’m going to use fresh Homegrown Dill heads along with fresh Homegrown Hot Peppers! First, I need to get the water boiling as I need to sterilize the jars. Always sterilize the jars first when you are doing a boiling water bath! Once the water is boiling (with enough water to fully cover the empty jars) I use tongs to submerse the jars and boil them for 10 minutes. Meanwhile, after cutting all the straight Scapes to a length to precisely fill the pint jars, I then cut the Curly Scapes into 2 or more pieces. These will go in separate jars. At this point, I got the liquid mixture ready and put it on the stove to boil. I don’t like to do this too early in the process, as I find that it evaporates and I don’t have enough liquid to cover the Scapes in the jars. I gave all the Scapes a good washing, then started packing them into pint jars. I cut the Hot Peppers into slivers, and included one of each colour in each jar. These should really pack a punch, because those Peppers are pretty Hot. Meanwhile my canning seals and lids were sitting in scalding water waiting to be put on the jars. 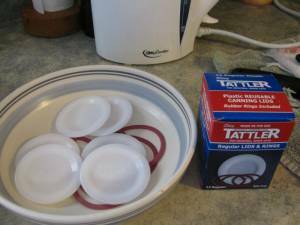 These are the Tattler lids and seals, which you can learn more about here. I love using this product and recommend Tattler – using these lids and seals, you can get many many years of reuse from them. How nice not to have to buy new seals each year! After filling the jars with Garlic Scapes, I poured the boiling liquid over top, leaving 1/4 inch of headspace. Before putting on the seal, I wiped each jar rim with a piece of clean paper towel. It’s important not to reuse the same portion of paper towel for the jars. You don’t want to have lifted something off one jar, only to deposit it onto another. Time now to set a seal on the top of each jar. Followed by the lid, then screw on the metal band. With the Tattler lids and seals, I need to screw the band on loosely and hold the lid in place with my finger while I finish tightening the band. Then I need to turn the band BACK 1/4 inch. This is to allow the jars to vent while they are being processed. Into the boiling hot water bath the jars go, and once the water is fully boiling, I set the timer for 15 minutes. I need to add 5 minutes to the processing time, as I live at almost 3000 feet elevation. MAKE SURE you check your altitude before canning. The elevation plays an important part of the canning process and you must be sure of how many minutes you need to process your food. 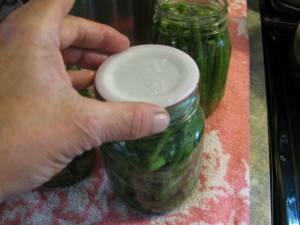 I often will have to remove water from the canner when I add the jars. You may need to as well, as the jar contents are heavier than the water. You need enough water to cover the empty jars completely when sterilizing, but that may be too much water when you add the filled jars. I keep a ladle and a large empty saucepan nearby so I can easily and safely remove some of the water while adding the filled jars. 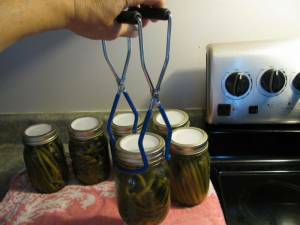 After the 15 minutes are up, I use the canning tongs to remove the jars. I immediately tighten the metal bands on each jar. Now I let the jars sit undisturbed for 24 hours, then I wipe them down and put them away into the pantry or cold room. I can remove the metal bands now if I wish. They serve no further purpose (sealed is sealed) and I can reuse the bands on other canning. Right after I remove the band, I check the seal to ensure it is sealed. Just gently pick the jar up by the seal. If the seal comes off, you can either put the jar into the fridge and use the contents within a week or you can reprocess the jar in the boiling water bath. 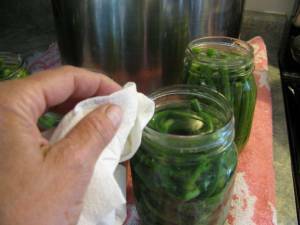 A final word: I am not a canning expert. 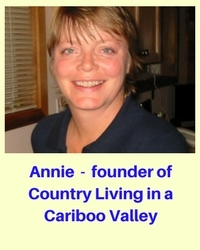 I have however, been canning food for well over 20 years. 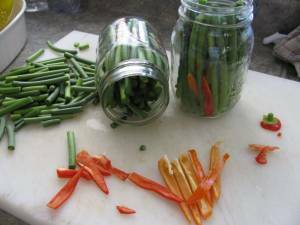 Canning is safe to do and safe to feed your family, but do NOT cut corners. I cannot stress that enough. Do not go to all the trouble of preserving if you are not going to follow exact instructions. They are in place for a reason – if you do not can safely and accurately, you run the risk of feeding your family spoiled food. This can cause very severe illness and even death. You can’t always smell the bacteria, so don’t rely on your nose! Please go to websites such as Kerr or Bernardin to find specific canning instructions. Part 3 of Grow Garlic can be found here. If you have any questions, please let me know in the Comments. 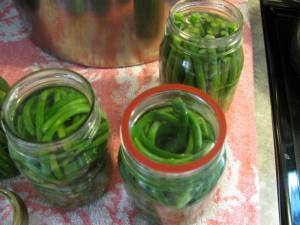 Now, start canning and filling your cupboard shelves with your own, freshly grown food. 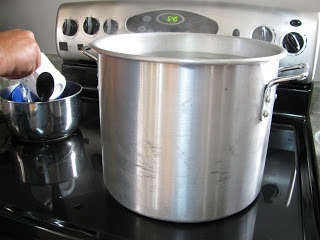 Water bath canning is easy, safe and can save you a lot of money. 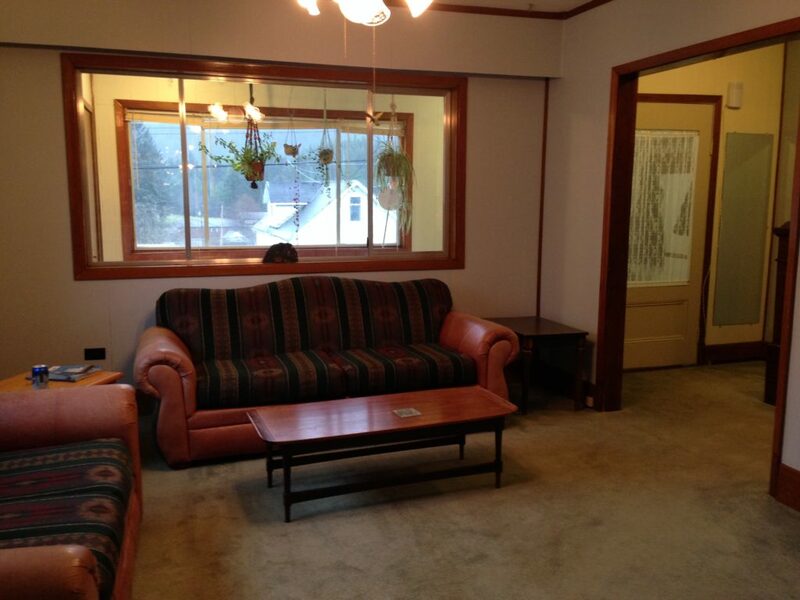 Do the work now while the harvest is here and you will enjoy that harvest right over Winter! Oh yummy, I never thought about pickling them before. I bet those are very good! 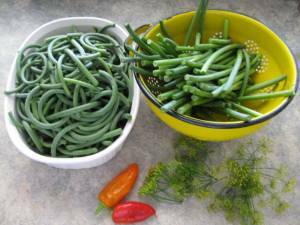 Mmmm, I love garlic scapes! I am sure these are wonderful. I am pickling these days, but the cucumber variety. Dill and Bread and Butter. What else do you pickle? I’ve sure learned a lot about garlic and how to grow it. I always thought it would be hard to grow. I’ve never heard about the scapes, but nice to know. Thanks for teaching me about garlic. I learned something today, that I’m going to use next spring when I plant some garlic.